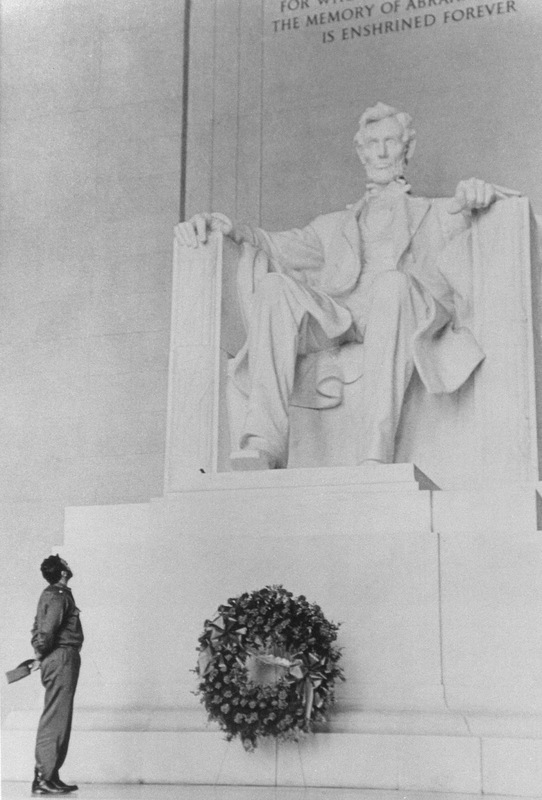 Castro visiting the Lincoln Memorial during his visit to the United States, 1959. Shortly after Fidel Castro took power in Cuba in 1959, he visited the United States for two weeks, invited by the American Society of Newspaper Editors. The trip had all the features of a diplomatic tour— he met American officials, appeared on Meet the Press, and visited national landmarks such as Mount Vernon and the Lincoln Memorial. Instead of meeting Castro, Eisenhower left Washington to play golf. Vice President Nixon met Castro in a 3-hour long meeting. Nixon asked about elections, and Castro told him that the Cuban people did not want elections. Nixon complained that Castro was “either incredibly naive about communism or under communist discipline”. Castro took full advantage of his 11-day stay. He hired a public relations firm, ate hot dogs, kissed ladies like a rock star, and held babies like a politician. During his visit Castro laid a wreath at the Lincoln Memorial and stood for some minutes in silent contemplation before the statue. The moment was immortalized by his photographer Alfredo Korda. The New York Times described Castro’s visit at the memorial: At the Lincoln Memorial, Dr. Castro walked up to the crowd of several hundred, shook hands, and chatted. Then he went up the steps to the memorial and slowly, in a low voice, read the Gettysburg Address inscribed on the wall. “Formidable and very interesting!” he murmured. Fidel Castro remained an admirer of Abraham Lincoln for the next half a century. He had a bust of Lincoln in his office, and wrote that Lincoln was devoted “to the just idea that all citizens are born free and equal”, and once even saying, “Long Live Lincoln!”. Not long after his visit, the U.S. would impose trade restrictions on Cuba. And just three years later, the world would almost go to war over Soviet ballistic missiles stationed on the island nation. Fidel is about to outlast yet another U.S. president.